For the freshest start to 2019, book your oven cleaning New Year appointment. Rid your oven of all that Christmas turkey fatty mess, and enjoy positive, sparkling, and spotless cooking. Always a breath of fresh air. 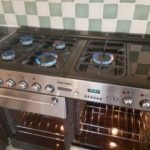 Oven & Range Cleaning are proud to be your local independent, professional oven cleaning service. We cover Gloucester City, and live locally. We are family-run, and our values are to be polite, punctual, and professional at all times.